The Bubar family, one of the program’s host families, graciously hosted a welcome mass and dinner to kick off the first year of the NPH International Leadership Program on Sunday, September 25th. Longtime supporter and close friend Fr. Tom Belleque said mass in the Bubar’s home for all of the host families and other friends who will serve as our leaders’ support network during their year in Seattle. Before the mass began, each of the five young leaders stood up and introduced themself and their host family to those gathered. Kara King, the leadership program director, gave a heartfelt welcome and thank you to all those who have made this program possible. Fr. Tom’s homily reflected on how God calls us to be leaders, and named many qualities good leaders have or strive for. Digyana added that the gospel reading tells us God values actions more than mere words and that we don’t always need to wait around until we are told what to do, but rather a leader knows what needs to be done and does it. After mass everyone shared a potluck meal and talked about their various connections to NPH and Friends of the Orphans. There was a palpable excitement in the house for this pilot year of the program and the wonderful potential and opportunity it holds. Juan Manuel from NPH El Salvador is also in Seattle for a couple of weeks to participate in Friends of the Orphans fundraising events by sharing his story through music. Juan Manuel is a very skilled guitarist and he played a couple of his original songs for a part of the group. We have been lucky to have so many special members of the NPH family in Seattle this fall. The group eventually disbanded with many hugs and well wishes for the young leaders as they begin classes this week as last week was dedicated to orientation and class placement. Thank you to those who were able to share in the mass and dinner with the program participants. We would like to extend a special thank you to all those around the world who have made this program a reality, despite not being in Seattle, because you recognize the importance of a program like this and the wonderful fruits it will bear. Our young leaders are anxious to begin in earnest this new adventure. 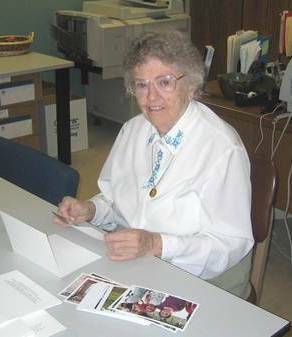 In loving memory of Sister Fidelis Halpin, OP. Born March 8, 1913 – and called to eternal life in the 79th year of her religious life on September 16th, 2011. As we celebrated the life of Sister Fidelis this week in Seattle, leadership program participant Digyana found a way to put into words the gratitude and love that so many of us feel for her. (Translated into English below). Hoy 22 de septiembre asistí a una vigilia dedicada a la Hermana Fidelis…..Muchos se preguntarán quien fue ella?, y tal vez al igual que yo nunca la conocieron… Pero en realidad teníamos un gran vinculo de amor ya que la Hermana Fidelis era parte de nuestra gran familia de Nuestros Pequeños Hermanos!!!! Gracias a otras personas tuve la oportunidad de saber que ella era una persona llena de muchas virtudes y llena de alegría….y que por muchos años se dedicó a ayudar a muchas personas y que también dedicó mucho de su tiempo ayudando a nuestra familia de NPH. 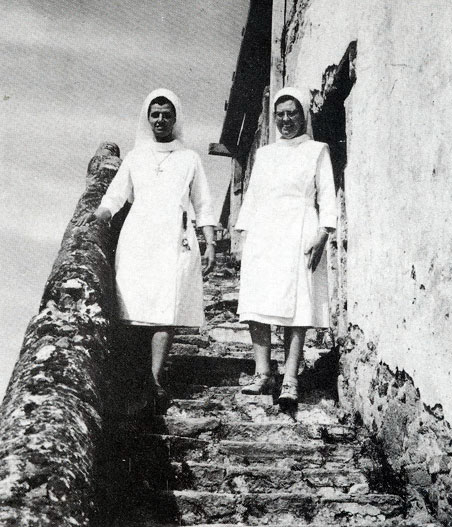 Lo que les contaré ahora es para que cuando tengamos la oportunidad de conocer a alguien o de querer hacer algo lo hagamos sin dejar pasar el tiempo o el momento…… Un día caminando con Stephanie Schuler cerca del lugar donde vivía la Sister Fidelis ella muy alegre comenzó a platicarme un poco de la Sister y me contó que ella había trabajado por nuestra familia junto a nuestro querido Padre Wasson…Me dijo que ella estaba muy viejita y que estaba muy enferma…..pero aunque estaba enferma siempre tenía una gran sonrisa para todos…… Ese día nosotras andábamos un poco de prisa y no logramos ir a visitarla y Stephanie me dijo que un día iríamos a visitarla. Dos días después alguien me dijo que ella había muerto, ya verán que triste me sentí, al pensar que tuve la oportunidad de poder conocerla y decirle gracias por la ayuda dedicada a nuestra familia de NPH…. Pero yo sé que ahora ella está en el cielo junto a Dios y al Padre Wasson… y que toda la ayuda y tiempo que ella dedicó a nuestra familia de NPH no fue en vano…porque gracias a todas las ayudas que recibimos somos muchos jóvenes en nueve países que tenemos la oportunidad de tener una nueva oportunidad de vida donde se nos brinda todo lo necesario para ser personas de bien!!! Today I attended a Vigil dedicated to Sister Fidelis. Many of you will ask who she was and perhaps, like me, never knew her. But in reality, we have a loving connection with her because she was part of our NPH Family. Thanks to other people here, I have had the opportunity to learn that she was a wonderful person who was full of joy; and that for many years she dedicated her life to helping many people, including our NPH family. It was not a vigil where everyone cries from sadness. What I liked the most was that there was a moment in which people where invited to share stories of Sister. Honestly, I didn’t understand everything. But from what I could understand, I know that the people who shared these stories felt blessed to have known her. One of the people even shared that Sister enjoyed parties! What I want to tell you now is that when we have the chance to meet someone or do something important we should do it! One day, Stephanie and I were walking near Sister’s home and Stephanie began to tell me about her and how she had worked with NPH and with our beloved Father Wasson. She told me she was elderly and quite sick, but even so she always had a huge smile for everyone! That day we were in a bit of a hurry so we weren’t able to visit her. Two days later I learned she had passed away. I was so sad, knowing that I had missed the opportunity to meet her and thank her for all she did for our NPH family. However, I know that now she is in heaven with God and Father Wasson and that all her service and time was not in vain. Because thanks to all the help we receive, we now have many young people in nine countries who have a second chance in life. Julissa recounts our leaders’ afternoon getting to know parts of Seattle. Translated from Spanish for now, but soon to be in their own English! We had a great day today seeing downtown Seattle. Katie Bray (former Guatemala volunteer) and Krisanne (local volunteer), took us on a tour of a few beautiful places in Seattle. We first went to the Public Market (Pike Place), we were amazed by the size of the fish and shellfish they sold there. The men selling the fish would yell and throw the fish every time someone made a purchase. It was funny. We also went to a store of strange things (Ye Olde Curiosity Shop) where they had mummies, witches, silly glasses and other things we had never seen before. It was a lot of fun. Next they took us to Seattle Center where they have carnival rides. We rode the carousel like little kids! The girls then took some pictures while the boys played racing video games. Finally, Katie and Krisanne took us to the lake and we saw some big ships there on the water. It was a very fun day and, thanks to God, everything turned out great. It was a little tiring, but we had a great day. El dia de hoy nos la pasamos muy bien conociendo el centro de Seattle. Katie Bray y Krisanne (voluntarias), nos llevaron a recorrer algunos lugares lindos de Seattle. Conocimos Public Market, nos impresionó el tamaño de los pescados que venden en ese lugar, los mariscos entre otros. Los hombres gritan y tiran los pescados entre ellos cada vez que alguien hace una compra. Fue chistoso. También conocimos la tienda de cosas extrañas, habían momias disecadas, brujas, lentes que daban risas, cosas que jamás habíamos visto, nos divertimos mucho. Luego nos llevaron a conocer un lugar donde habían juegos mecánicos. Nos subimos al carrusel como pequeños, jajaja. Luego las niñas nos tomamos fotos, mientras los chicos jugaban en las máquinas de carros. Conocimos el lago y grandes barcos de ese lugar. Fue un día de diversión y todo salió bien Gracias a Dios. Un día muy lindo y candsado pero lindo. Wendy, Julissa, Digyana and Emir have met twice before Seattle at the NPH International Leadership Conferences hosted first in Honduras in 2010 and then in Nicaragua in 2011, so it was nice to see some familiar faces when the group got together Sunday for their program orientation and a quick tour of where they would be studying at Seattle Central Community College. Next it was Jean Francois’ turn to see a familiar face. The Friends Northwest office, with help from some longtime supporters, hosted an event for people to meet another member of our NPH family who was in Seattle, Fr. Rick Frechette. Fr. Rick is the National Director of NPFS in Haiti and has lived and worked there for over 20 years. Fr. Rick talked about the slow recovery process Haiti is going through since the 2010 earthquake and the amazing work NPFS has been able to do because of donors all over the world. Jean Francois had been working with Fr. Rick in the Father Wasson Angels of Light program, a program which provides food and classes to nearly 2,000 children who have been living in tent camps since the earthquake. In attendance were many NPH/NPFS and Friends of the Orphans supporters who will form the participants’ community and support network throughout their year here. All five of the young leaders were introduced at the event and received a warm round of applause. There is a lot of excitement around the first year of the program here in Seattle with many people working in different capacities to ensure it is a great success. Stay tuned for updates from the group’s first week of English and leadership classes! 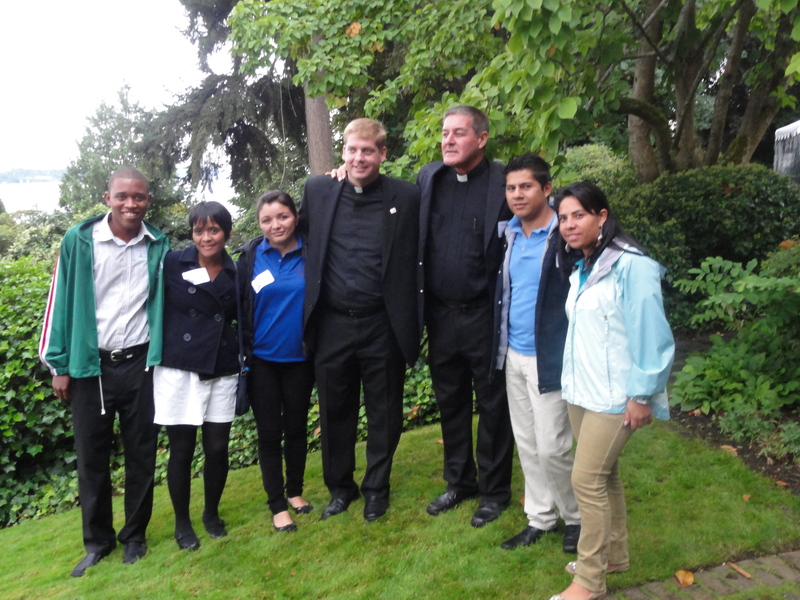 The vision of the International Leadership Program is to develop an ongoing leadership and language study program in the Seattle area for young people who have grown up in Nuestros Pequeños Hermanos (NPH, Spanish for “Our Little Brothers and Sisters”) homes and who have the expressed desire and motivation to continue Father Wasson’s vision of his older children caring for the next generations of children in need. The program will train, support and inspire a future generation of young leaders who will return to their communities with the skills necessary to create sustainable NPH homes and outreach programs. As a group, the participants will explore best practices for implementing the NPH philosophy, learn more about their own leadership styles and develop strategies for leading during challenging times. Participants will gain experience through volunteer opportunities, job shadowing, and internships in their individual fields of interest. 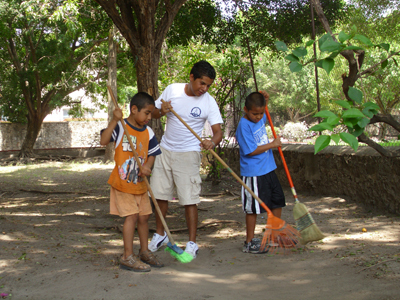 Emir is 19-years-old and was in his year of service, working with 23 young boys, ages 7 -14. Emir is also Coordinator of the Estudiantina Group, NPH’s traveling dance and music group, which honors Mexico’s rich tradition and culture. Emir’s passion for music made him a natural leader within the group. He is responsible for overseeing rehearsals and preparing performers for their travels. Having had the opportunity to travel to the United States on nine separate occasions, Emir is looking forward to his time in the Pacific Northwest and hopes to gain experience that will help him learn new ways to support and encourage his NPH family. Emir would like to study medicine and aspires to give back to NPH in the future by working at NPH’s St. Damien Hospital in Haiti. Julissa at NPH Guatemala in the vocational workshops. Julissa is 23-years-old and is currently the Coordinator of Workshops in Guatemala, where she runs NPH’s programs certifying youth to help ensure future employment. As a Secretariat, Julissa is responsible for overseeing the various human resource and general accounting tasks for the Workshops Department; she also serves on the Youth Leadership team at home, and organizes activities and fun excursions for the children. While serving her NPH family, Julissa has been inspired by the common spirits of struggle, brotherhood, and perseverance held by her fellow brothers and sisters. She plans to continue organizing volunteer projects and giving back to the poor in her community. Julissa is excited for her time in the Pacific Northwest, where she hopes to be prepared for university. Jean Francois at work at NPH Haiti. Jean-François is 23-years-old and first arrived at NPFS, along with his brother, at age 7. He is currently working as the Project Coordinator for NPFS Haiti, organizing the development projects taking place at the home. Jean-François has also worked as Communication Coordinator for Father Wasson Angels of Light and as a radiology technician for victims of the earthquake at St Damien’s. He plans to attend university while continuing work at NPFS Haiti and hopes to eventually become a National Director of NPFS Haiti or one of the directors of NPH International. A strong believer in the power of education, Jean-François wants to work at NPH in the future in order to give other children the opportunity to go to a good school, attend university, and become independent adults who will dedicate themselves to ensuring the well-being of their country. 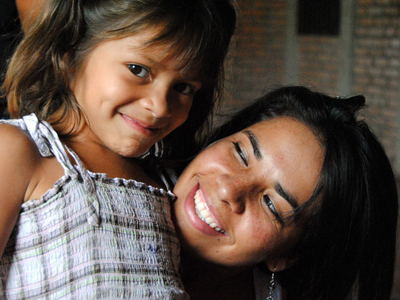 Wendy with Marta at NPH Honduras. Wendy is 25-years-old and came to NPH with her older brother and younger sister when she was 11. During Wendy’s Year of Service cared for her younger brothers and sisters. Wendy prepared activities, readied them for school, and helped them with their homework in the evenings. Inspired by her time supporting working with young children, Wendy joined the Youth Leadership Group in Honduras, where she served as a leader for NPH by encouraging participation in community outreach programs. Wendy is looking forward to becoming bilingual during her time in the Pacific Northwest. Afterwards she hopes to continue her university education in Speech Communication and then return to share the story of NPH with others as a communications officer. 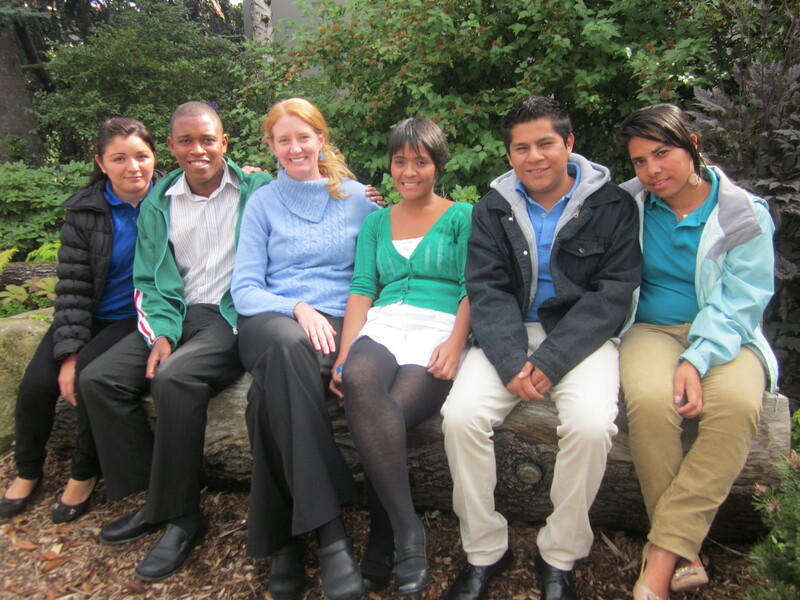 In 2009, I sat with a colleague from NPH Bolivia exploring the possibility of our kids studying in the Northwest. We sat near the lush Amazon River Basin, the stars overhead allowing us perhaps to dream a little more than within the constraints of our offices, or the pressures of our daily NPH work would permit. And so, on the back of a napkin we jotted down ideas. A vision for a formation program that would prepare our young people to become agents for positive change in their home communities; whether within NPH homes as directors, caregivers, nurses or social workers – or within the context of one of NPH’s many outreach programs in the local communities. We talked of the enormous potential within our young people, their amazing capacity to serve and love well. We imagined giving them time to explore their unique leadership styles, better understand their strengths and weaknesses, grow in their faith, increase their self-esteem and learn a second language. We envisioned sharing with them a variety of tools and strategies that would help them in their personal journey, and creating a safe space for them to learn from each other. Two years later, many wonderful people have contributed their time, resources and ideas to this vision. And so, we stand ready to welcome our Charter Cohort of the International Leadership Program to Seattle. Five amazing young people from four NPH homes will arrive during September. They were chosen from over 25 applications received from seven NPH homes. The application process included essay questions, as well as submitting a resume and letters of reference. The applications were screened by NPH National Directors as well as other people within NPH and Friends of the Orphans. All the participants that were chosen have expressed the desire to serve their NPH family in the future in some capacity. During the coming nine months, these emerging leaders will engage in experiences and activities purposefully designed to encourage their growth and development as leaders. An amazing community is taking shape around this vision; including our wonderful host families who will welcome the pequeños into their homes, former NPH volunteers who will offer support for retreats as well as a peer group for the participants, the NW Friends of the Orphans office stepping up as mentors and rallying to fundraise for this program, and many local church leaders, leadership trainers and facilitators who will teach in their area of expertise and who are already lending their support and wisdom to the program. Leadership Development: The participants will engage in weekly meetings focused on leadership and personal growth. Retreats, along with attendance at workshops and panels spread throughout the year will deepen the experience and provide additional training. Mentoring/Community: The participants will be connected with local mentors who will encourage and accompany them now and then continue to support them as they return to their home countries. We will strive to develop an intentional, service-oriented and globally-minded community for encouragement, sharing and learning. Service/Practical Experience: The participants will have ample opportunity for job-shadowing, assisting with fundraising efforts at Friends of the Orphans and sharing the NPH story with a variety of audiences as the year progresses. If you would like to learn more about the program, please don’t hesitate to contact me!